Chingy was on the hot30 countdown with Sam Mac and Biggsy on Thursday (November 16) on 2Day FM in Sydney, Australia. The rapper talked about where his nickname came from, what makes him hyper, if he has a sneaker obsession, the album ‘Hoodstar’, and his pitch to see his show that night. 2dayfm.com.au has since removed the audio. Rap acts on television this week include Chingy, who is featured on ‘The Tyra Banks Show’ on Monday, where Tyra dresses up as “Uncle D”, a member of the rapper’s posse; The Game, who visits ‘Total Request Live’ on Monday and performs on ‘The Late Show with David Letterman’ on Thursday and ‘Last Call with Carson Daly’ on Friday; Snoop Dogg, who visits ‘TRL’ on Tuesday; Xzibit, who performs on ‘Last Call’ on Wednesday; Ice-T, who visits ‘The Late Late Show with Craig Ferguson’ on Friday; and Flavor Flav of Public Enemy, who visits ‘Late Night with Conan O’Brien’ on Friday. Rap acts on television this week include Chingy, who performs on ‘The Tonight Show with Jay Leno’ on Tuesday and ‘The Ellen DeGeneres Show’ and ‘The Tonight Show with Jay Leno’ on Thursday; Young Dro, who visits ‘Total Request Live’ on Thursday; Sean ‘Diddy’ Combs, who performs on ‘The Late Show with David Letterman’ on Friday; and Busta Rhymes, who performs on ‘Last Call with Carson Daly’ on Friday. Chingy and The Game appeared on ‘Total Request Live’ at MTV Studios on Thursday (September 28) in New York City. Check out pictures from GettyImages and WireImage. Chingy is out with the video to his new single ‘Dem Jeans’, featuring Jermaine Dupri, from the St. Louis, Missouri rapper’s third album ‘Hoodstar’, released on Capitol Records. Watch it via YouTube below. Chingy, Lil Scrappy, Young Buck, 50 Cent, and Lloyd Banks were on hand for a taping of MTV Presents ‘Sucker Free Spankin’ Free Music’ on Monday (September 18) at MTV Studios in New York City. Check out pictures from FilmMagic, GettyImages, and WireImage. Chingy was in the studio with JoJo Wright of KIIS FM in Los Angeles the other night for the Top 9@9. The rapper discussed his blinged out watch, his movie roles — that don’t include ‘Crackheads’, the new album ‘Hoodstar’, and he took some phone calls. Chingy, Paul Wall, Slim Thug, and Snoop Dogg were on hand for Dub Magazine’s 6th Annual 2006 Custom Auto Show and Concert on August 6th at Cobo Hall in Detroit, Michigan. Check out pictures from WireImage. 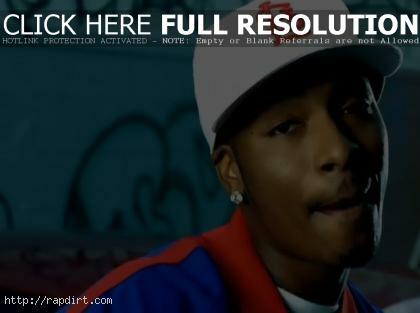 Chingy is out with the video to his new single ‘Pullin’ Me Back’, featuring Tyrese, from the rapper’s forthcoming album on Capitol Records. Watch it via YouTube below.